Can you believe it? Jesus called us slaves! Perhaps slavery was acceptable back in the days when the human Jesus walked, talked, and gave reality to God’s Kingdom but since the end of the War Between the States slavery has not be acceptable in our world. On the surface we get the idea that slavery is about serving because that is what slaves do, they serve their masters just as Jesus said. However, the truth is slavery is more about control and subjectivity then serving. Jesus talks about the relationship between master and slave in chapter 22 of Luke this way. “Who is more important, the one who sits at the table or the one who serves? The one who sits at the table, of course. But not here! For I am among you as one who serves.” (Luke 22:27, NLT) Normally we attribute importance not to the slave but to the master however Jesus does what he does best and turns the world upside down, “But not here!” he exclaims. Excuse me for reversing the order of the verses but then again with the world upside down he sits the record straight. “But don’t be like them. The most important one of you should be like the least important, and your leader should be like a servant.” (Luke 22:26) Jesus leaves us with little doubt God is the Ultimate Master but the Psalmist points out that we were created a little lower than the angels. 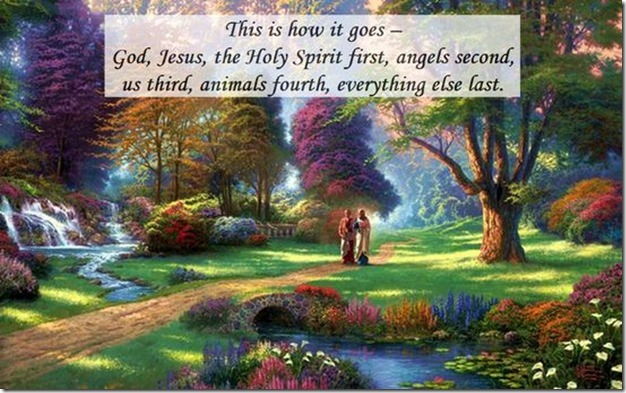 This is how it goes – God, Jesus, the Holy Spirit first, angels second, us third, animals fourth, everything else last. Therefore along the line of succession in creation we are the masters while money is our slave. Now back to the slave thing. Since God is the Ultimate Master I, personally, have no problem being a slave living under His authority however are we supposed to draw the line there and be and be a slave to no one else? In this dog-eat-dog-survival-of-the-fittest-I’m-number-one-world the answer is NO we answer to no one! However, the apostle Paul throws us a curve ball, “I am not anyone’s slave. But I have become a slave to everyone, so that I can win as many people as possible.” (1 Corinthians 9:19) Unfortunately not everyone can hit a curve ball. Can you?